Students of PIMA examine living under surveillance in new production at the Brooklyn Navy Yard. 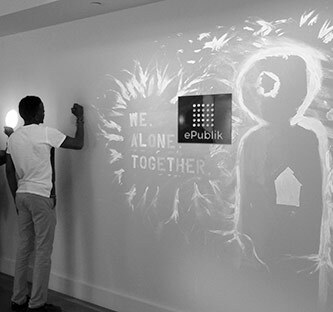 Participants in the Private(i) performance get to leave their mark—with invisible ink. By the year 2020, privacy will not only be a revolutionary act, but will come at great cost. At least, that is the premise of Private(i): Enjoy the Hide, an interactive performance crafted by a group of Brooklyn College students from the Performance and Interactive Media (PIMA) Program. Held on April 26 and 27 at the Brooklyn Navy Yard—not far from Brooklyn College's new Barry R. Feirstein Graduate School of Cinema at Steiner Studios—Private(i) took participants on an all-access tour, granting them entry into spaces not normally open to the public. Whether it was admiring breathtaking views of Brooklyn from rooftop facilities or subterranean exploration via dark and hidden rooms and tunnels, each participant was encouraged to contemplate the meaning of privacy in their lives. Fixed Agency, the collective that conceived Private(i), is made up Isaac Eddy '14 M.F.A., Peter Musante '14 M.F.A., Rachael Richman '14 M.F.A., and Eva von Schweinitz '14 M.F.A., all of whom graduated from the PIMA Program this spring. They designed the interactive performance piece as a critique of the post-9/11 world where purchase histories, web browsing, and digital communications are subject to government surveillance; smart devices can be used to keep track of users; and video-recording devices can be operated remotely through drone technology. It was also their attempt at reclaiming the privacy that has been lost—an act described as "aloning" by its creators. We. Alone. Together. Take a trip with a Private(i), risk reclaiming privacy that has been lost, and enjoy the hide! "With Edward Snowden revealing the enormous scale of the National Security Agency's surveillance and observing the subsequent defeat and cynicism in the response of the people, 'I've got nothing to hide; they can look as much as they like' became a statement we wanted to investigate. There were a lot of ethical questions to be explored," said von Schweinitz, speaking for the agency. Punctuated by music, poetry, and song, the journey both unsettles and inspires awe. As the members of Fixed Agency lead participants down closed-off roads, up and down stairs, in and out of freight elevators, onto balloon-decorated trucks, and into dank basements transformed into ritual altars, it becomes surprisingly difficult to discern who and what is or is not part of the performance. That seamless creativity, Fixed Agency says, is a direct result of the skills they gained by studying in the PIMA Program. "We knew that we wanted to make an experiential piece outside of a black box theater," von Schweinitz said. "Being chosen as 2014 Visiting Artists at the Brooklyn Navy Yard provided us with an amazing space and opportunity to put up the kind of piece we had in mind. Its covertness, the fact that nobody really has access to it, allowed us to create an experience that in itself seemed 'off the grid.' We tried to really work with that and find the most hidden and odd places, and show people a different kind of reality." For information about upcoming Fixed Agency events, please visit their website.